Since we tend to spend more time indoors this time of year, why not make the most of the space we have? Your basement can be transformed into many things, both practical and fun. Also, because most unfinished basements are not used on a regular basis, the project won’t have a great impact on day to day living while in progress. Convert your basement into a workshop/art studio and your family can spend valuable time together working on projects and other hobbies. Transform your basement into a dedicated entertainment center! Here’s where you can devote an entire space to whatever you or your family enjoys the most. You can make a mini-arcade, pool hall, bar, mini-home theater (with seats, sound system, and projector/screen) -- the possibilities are wide open. Tired of waiting in line at the gym? Set up your own workout space, complete with floor mats, mirrors, and sound system. Keep the chores out of the way by re-locating your laundry room. If your home layout allows, you may even consider putting in a laundry chute to both save on trips downstairs and centralize your dirty laundry buildup. This can be as large a remodeling project as you’d like. From a complete overhaul to simple weekend projects. Refinishing or re-facing your cabinets is a great way to make a significant impact in your kitchen. Couple that with a new color scheme and coat of paint and you’ve got a whole new look! Consider the option of simply repainting or staining your cabinets and adding new hardware and you’ll be able to capitalize on the savings by adding a new appliance. 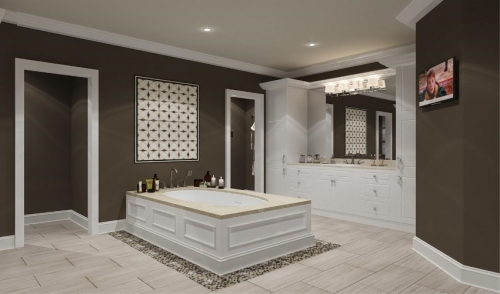 Depending on the condition of your bathroom, a remodel can be achieved within just a few days. A quick makeover with updated fixtures and lighting is an excellent way to scratch that winter home improvement itch. A great way to make a difference without having to remove any fixtures would be to install crown molding and apply a fresh coat of paint. You can achieve elegance in just one weekend! Bring in a little of the outdoors! If you’ve got an unused corner, preferably near a window, why not convert that space into an indoor garden? Bring in outdoor urns and planters and fill them with your favorite plants. Plus, you can install a skylight above if your floor plan allows. Maybe even lay stone tile and brickwork to create a true outdoor feel. Welcome in the bright winter sun and improve your view with a new bay window. You can even incorporate a window seat/daybed into your plan. It’s never a bad time to insulate your attic. To find out if you have enough insulation already installed, measure the thickness. If you have less than 11 inches of fiberglass or 8 inches of cellulose, you’ll benefit by adding more. Once you get started on your winter remodeling project, you’ll soon find yourself distracted from the cold realities of winter. Besides enjoying yourself, you’ll also be adding value to your home!